I had the hardest time figuring out what to make for gifts for my bridesmaids. My initial thought was shawls, but, well, there were 6 of them and even though I got engaged waaaaaay back in 2011 and therefore theoretically could have knit 6 shawls in that timeframe, I didn’t know how long our engagement was going to be but I did know that my fortitude for non-selfish gift knitting tends to be limited, so it was not likely to happen. Copyright Eskimimi. Click for pattern page. 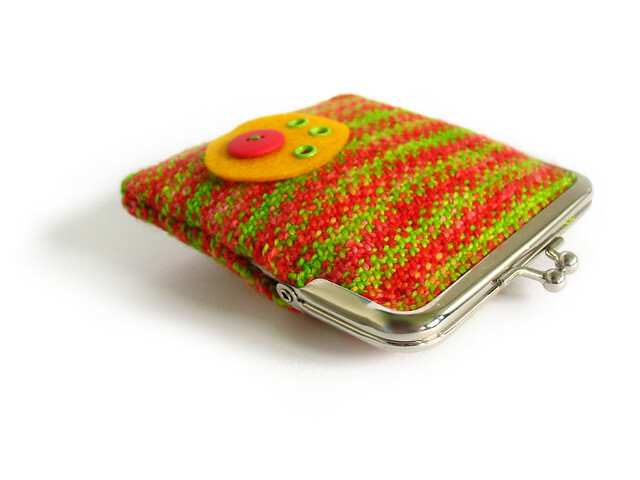 Then I saw this cute little coin purse and thought oooh! I could make this bigger, get a fancier purse frame, and make little clutches! The thought of all that linen stitch was a little daunting, so I figured I could perhaps make squares on my Zoom Loom and make patchwork bags. Then I hurt my wrist back in March and using the loom was a little too painful. Copyright kateclysm. Click for pattern page. So then, I was thinking I’d maybe make these cute little bangle bags, which would still require sewing a lining onto the back of knitted fabric (which worried me) but at least wouldn’t involve sewing into a purse frame. But still, I wasn’t totally thrilled by the idea and didn’t really know where to get the bangles. Copyright Lion Brand Yarn. Click for pattern page. 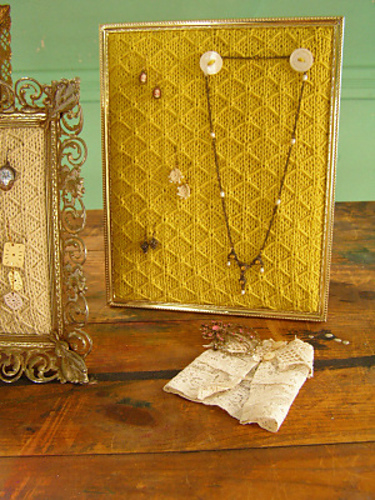 I finally stumbled across this quilted lattice jewlery frame, and knew this would be perfect! Since I had already ordered purse frames I went back and forth debating for a while. It was a difficult debate since most of the people I usually consult for knitting advice were in the bridal party! I had to rely on my friend Jeremie, who was not particularly interested in either purses or jewelry frames. I kept coming back to the frames, though, and decided to go for them. I finally started knitting them at the end of May, and finished them up in the first week of July. So, I had to knit one of these each week. I used my swatch to determine how many to cast on to fit in an 8×10 frame. It’s a good idea to underestimate how many stitches you need as your yarn will likely stretch and you want the fabric to be taught. I used a totally luscious yarn for this: BMFA Marine Silk Sport, colorway Oceana. The frame requires a little work before you attach the knitting. We (I say we, since the FiascoHubs helped) used the matting from the frame as a base, then cut out quilt batting to the same size and plain fabric about an inch larger. Then you make a little batting sandwich and use double-sided tape to fold the fabric over and secure it to the back of the matting. Finally, you do the utterly unthinkable and take a stapler to your silky, luxurious knitted fabric. You carefully staple all around the edges of the piece to secure the knitted fabric to the fabric backing. Not gonna lie, this part was painful. But the results were so worth it! I love how these little frames turned out and I know at least one of my friends is already using hers. I didn’t want to just give these frames, however, so I also made some earrings to go with it (no, I don’t know what came over me). These things came out better than I had expected and were surprisingly easy to make! Here is the super helpful tutorial I followed. I was so encouraged by my success with these earrings that I decided to make my own wedding jewelry. I looked at a few wire jewelry photos for inspiration but basically just winged these designs and am really thrilled with how they came out. I love the little pop of color they added to my wedding ensemble, too. That’s the last of my crazy wedding crafting! I’m making one more frame for myself right now but then it’s back to knitting whatever-the-heck I want! Have you ever surprised yourself with your own crafting abilities or been suddenly struck by the desire to make something that you couldn’t quite explain? Check out more FOs at Tamis Amis. 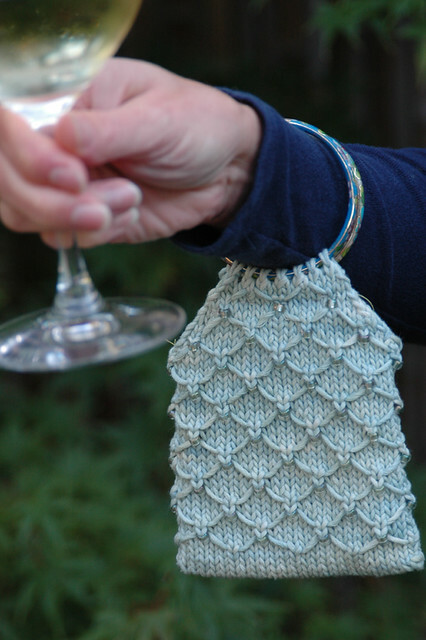 This entry was posted in BlueMoon, DIY, FO, FOFri, tutorial, wedding and tagged DIY, FO, knitting by shoelaceswitcher. Bookmark the permalink. Wow, those frames are great..and I love the jewelry…. Jewelry frames! So that’s what those lovelies are! The little drop earrings are so elegant and beautiful, too – and I love the extra little twist that you added to your own pair.